The big news from Uni Nationals 2014 is that the Uni Women’s Outdoors game has landed and is here to stay. 30 teams competed, a whole host of new names were at the top, and there was loads of individual skills and team strategies on display throughout the rankings – the level of the Uni Women’s game has escalated quickly and the next few years it will be very interesting to see where it goes! After coasting through the group, defending champions Sussex faced UMON winners Birmingham in the 2v7 quarter final. Having seen Birmingham’s girl-to-girl hucks get many points on the board in the final of UMON, Sussex knew they had a match (that was potentially worthy of being the final) on their hands, so came out firing with their long shots and clinical end zone play – but Birmingham seemed to be expecting it, bringing down some of the long discs and showing they had some expansive offence themselves – after half an hour the teams were tied at 5-5. Birmingham put on some clever forces and deep poaches to neutralise the fact that Sussex had both left- and right-handed players able to huck to speedy receivers – forcing them to play the short game where a few errors crept in. On offence, Brum were able to complete several long passes in a row after swinging the disc across the field or getting it up the line, making use of Grace and Kim’s (both from Nice Bristols) handling skills to put the disc in the end zone with most of their possessions, and bring down enough to go on a run at the end of the game to win 10-5 – advancing to the semi finals. Sussex went on to take 5th place without much trouble – conceding just 6 points in total for the weekend, excepting for the Birmingham quarter. London (Imperial/UCL/Kings) knocked out the higher-seeded Leeds in a controversial pre-quarter, followed by complaints of it being unfair because London are a ‘combo’ team made up from players whose universities don’t have enough to enter their own teams – perhaps the end of combo teams is getting nearer, as the outdoors game develops and gets closer to earning BUCS points? Will these London players be forced to miss UWON next year if they can’t get 10+ players together from their Uni to compete? London went on to face Bangor in a huckfest of a quarter final on a crosswind field, both teams fighting for the yards and sacrificing possession, eventually Bangor defeated the controversial London team and earned their place in the semis. Birmingham faced Durham (who had dispatched the athletic Nottingham team in the quarters) in the semi final, and it turned out to be a fantastic match, with Rebecca Devine having a stormer, helping Durham go up early (5-1) against a surprised Birmingham team who were possibly a little complacent after their win against Sussex. Birmingham brought themselves back though, scoring 4 in a row to bring it back level, and then trading points until it was sudden death – a thrilling point with a few turnovers before Durham put it in to ensure their place in the final – Becca making a great catch on the endzone line and throwing the flick assist to clinch it. Bangor went up against 2013 finalists Edinburgh in the other semi – it was a very exciting game with Edinburgh taking a small lead at the start but the teams trading points until Bangor were able to force a tough swing across Edinburgh’s endzone line, getting the turn and scoring a break quickly to bring the scores to 5-5… they traded to 6-6, then Bangor got another D on the endzone line and put it in to go up 7-6! Edinburgh then made an amazing catch on a bladey sidearm to bring the semi final to double game point… Bangor take a long shot but it turns over, Edinburgh try to swing the disc in front of their endzone again but the disc is a bit quick and there’s an unforced error, Bangor are within range and in two quick passes they score and put themselves into the Women’s Final! The final between Durham and Bangor looked like it was going to go Durham’s way at the start as they displayed great disc skills & the ability to swing consistently, but Bangor’s direct huck-to-the-endzone strategy started paying off and they went up early. Durham were able to get back into it, putting upwind and downwind points on the board until reaching sudden death! The sudden death point of the women’s final has been described as ‘racey’, with the action going from one end zone to the other, but the final pass failing to connect again and again… Eventually, after 30 minutes, Bangor secured the final catch upwind to win their second sudden-death match in a row and take the title of Uni Women’s Outdoor National Champions 2014! Dundee had won the Scottish regional final fairly comfortably. There has been a lot of talk about them in the last year or two, as they have performed consistently well indoors and at Mixed – getting to the final of UMON – but hadn’t yet been tested in Outdoors Open. In their group were Manchester, who last year defeated Sussex in their group and earned a semi final spot (Sussex ducked out in the quarters to eventual winners Cork), but Manchester had lost to Durham in the Northern Regionals final so it wasn’t clear how strong they were this year. They soon put any doubts to rest though, as they stormed to a 12-5 group victory over Dundee. Elsewhere in group A, Bath had a close game against Sussex 2 but won out 8-6, and then Manchester almost put their victory over Dundee to waste as they fell from being 3-0 up against Bath to being 9-8 down, game to 10. They were able to keep their composure however and get the two final scores needed to secure the top of the group and the #1 seed going into Quarters. Warwick didn’t have many difficulties topping this group with Heriot-Watt, York and Imperial – looking strong as 2nd seeds going into the quarters, with their fast paced, short-passing game, and smart anti-vertical stack defence which York couldn’t find a counter for. Heriot-Watt took 2nd in the group but then lost their pre-quarter to Edinburgh, whilst York saw off Imperial for the 3rd spot in the group but couldn’t overcome Sussex in their pre-quarter. Bristol performed well to top the pool over Glasgow, whilst Durham beat Birmingham 9-6 to avoid the bottom 4 – Birmingham being a strong team but this result perhaps alluding to the importance of the role their women played in their Uni Mixed Outdoors victory a few weeks ago. Glasgow held onto their 5th seed in the pre-quarters by beating Bath, who may have been suffering after coming off the back of their thrilling sudden death match against Manchester. Cambridge were showing their strength, despite lacking one of their top players from indoors, they went 5-0 up against Edinburgh (winning 9-5) and then took Sussex by surprise, going 3-0 up, and despite Sussex bringing it back to 4-3, they took the game away 8-3, making quite a statement going into the knockout stages. Sussex dispatched Edinburgh 13-4, and Edinburgh beat Cardiff 8-5 to avoid the bottom of the group. Bristol had a tough draw coming up against Sussex, went down early and weren’t able to bring it back in quite a bitty game that saw one of Sussex’s best receivers roll his ankle towards the end, putting him out for the semi final. Dundee vs Warwick was a great battle – the best from Scotland vs the best from the Midlands, and it lived up to it – Dundee went 3 points up at the start, only for Warwick to then go up 8-4! The hooter may have gone but Dundee had more to give, as they clawed point by point back to reach sudden death, shutting down Warwick’s quick offence and forcing a miscommunication to get the turn, then passing the disc around the endzone – Warwick put a bid in and touched the disc but it was not enough to stop the pass being complete, then a classic Dundee unexpected scoober into the back corner of the endzone for the game and a spot in the semi final! A fantastic game which Push Pass are thrilled to have caught on camera. Into the semi finals, and first seeds Manchester are facing Cambridge. The game is tight up until 3-3, at which point Cambridge really go into another gear and score 4 on the bounce, 7-3. Manchester adapt and respond to bring it back to 9-7, but Cambridge have too much depth and are able to finish the game off and knock Manchester out, 12-8. In the other semi final, 2011+2012 winners Sussex went up early against Dundee, both teams playing an exciting combination of fast disc movement and long throws, Sussex able to get a few more interceptions and come down with a few more scores in a game that stayed fairly tight all the way but always seemed just slightly out of Dundee’s reach, finishing 10-8 to Sussex and setting up a Cambridge Strange Blue v Sussex Mohawks final – a rematch of 2011! The final started promisingly with both teams scoring early. Cambridge put on a stifling zone which Sussex struggled to work the disc through, and their offence was formidable thanks to American player Justin, whose quick movement meant he was able to get the disc at almost any time he wanted and break the force with a huge range of very fast release points. Sussex couldn’t shut this down with their man-to-man defence, so Cambridge tore away in the first half of the game, going up 6-1. Sussex tried a number of different strategies including a zonal defence, but even when Justin was shut down, there was always quality support from all the other Cambridge players including Dom Dathan and Matt Shannon to step up and keep the offence alive. Sussex managed to get a few points on the board with Faron Young and ‘Shimmy’ John Maule throwing to Hayden Slaughter, Sam Airey and Alex Buckley, but an all-round solid performance from Cambridge’s Strange Blue who took the game 12-5 and earned the title of Uni Open Outdoor National Champions 2014, achieving the double this year alongside their indoors victory! In its 3rd year and attracting 9 teams, the Alumni division is a welcome recent addition to the Uni Nationals tournament. Hopefully the current students will be more familiar with the concept than those who have graduated years ago, so we will continue to see growth in this division as players come back to catch up with their old team mates and re-live a bit of their Uni days, not to mention fight for their team’s honour and offer loads of support from the sidelines to the current competing students! Push Pass hopes in future the Alumni final will be able to be watched by more current student players and be more of a showcase event, featuring many very talented and experienced players in a tough fought game! We filmed the final this year, which you can find over at the coverage page. Although we didn’t get to see any other Alumni games, word on the street was that Birmingham and Sussex were both relatively unopposed on their roads to the Final, but when they met it was a hard fought match with quality A-Tour players on both sides putting their all in. Birmingham went up early and Sussex brought it back, but Birmingham may have just had the legs on Sussex who were only fielding 8 players, and edged the game out to a 10-6 victory! Congratulations to Birmingham, Alumni Champions 2014! Next year, depending on the success of this year’s coverage, Push Pass hope to have another camera dedicated to covering Division 2, which we were unable to do this year. If you were involved or following Division 2 games, we’d love to get a report up here, so let us know! 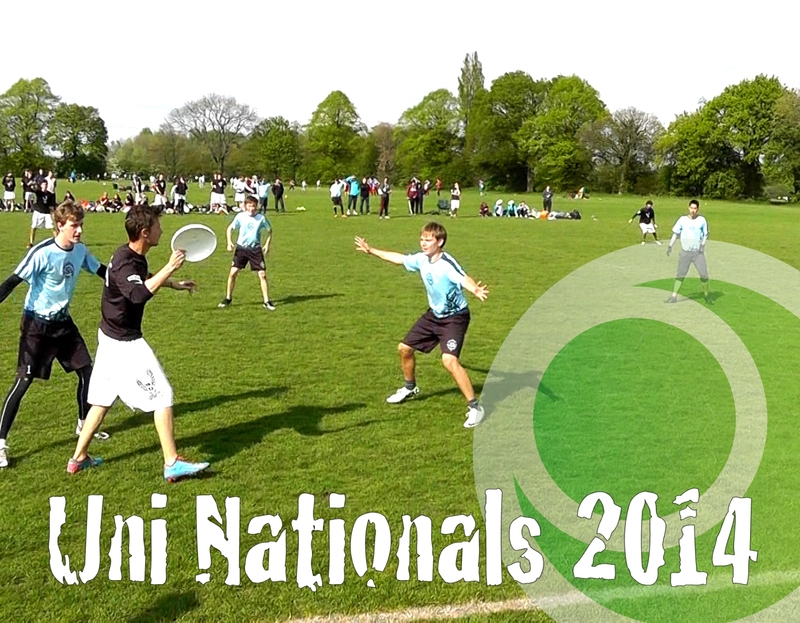 Push Pass filmed 24 games from Uni Nationals 2014, including the games talked about above, the semi-finals from Div 1 and the Women’s division, plus the Finals from Women’s, Div 1, and Alumni. Subscription packages are currently 50% off at £5.99, read more here or unlock the games immediately below!